Every company in business today is keen on carrying a top 3 KPI to attract as well as retain quality employees. The key to doing so is to build a fine & receptive culture which stands out and earns the company a place among the best employers in the industry. For most companies, attracting top talent isn’t usually the issue. It’s getting those people to stay with them and continue making the company excel in its particular industry that seems to pose the greatest problems. That can be attributed to the fact that many people will take a job that looks attractive to them. No one expects to be given a raise or bonus within the first few months of working somewhere, however if employees aren’t made to feel appreciated, they’ll look elsewhere and go to where they are shown the kind of rewards they seek. So as a company, what can you do to hold onto that top talent you have just brought in? Fortunately, there are a few simple and cost-effective things you can do that will ultimately bring about better growth, stronger productivity, and bigger profits for your business. In a survey of companies that had strong retention among their top tier talent, one of the biggest draws that kept employees in place was the freedom to innovate, make mistakes and implement their learning’s from the failed experiments. As rewards for high performance, desirable gifts could be earned as a bonus. Things like tech items, trips, and gift cards were all high commodities, ones that proved to have extreme staying power. However, something else had the same retention rate as special gifts: food. Companies that brought in great food for their employees were more likely to see those quality level people stay on. And furthermore, it showed that these well-fed people were even more willing to go the extra mile. In love, they say the way to the heart is through the stomach. It seems that in business, the same holds true. Disruption was once seen as something the attention-seeking child caused in the back of your middle school classroom. Nowadays though, disruption is something some of the biggest and most successful companies are incorporating into their daily jargon. On the offset, it’s sounds a bit bizarre, but if you think about it, shaking things up keeps them from ever growing dull. When we become successful, we tend to snooze on that success and ride it into shore. If we’re not paying attention though, we’ll find ourselves pulled under suddenly by a rip current. The market is often times as unforgiving as the seas themselves. While they seem wholly unpredictable, they ebb and flow as always, giving us something we can count on. The same is true of corporate food ordering. The options an Admin or HR or Procurement or Accounts teams employ to discover, order, pay & track needs a fundamental change. The supporting teams should be empowered with the new age tools, ordering platforms & techniques that provide great variety, convenient ordering, and pocket-friendly options. In the existing corporate and service providers ecosystem with broken processes, we see the supporting departments doing a lot of heavy lifting to discover a new set of hospitality partners to provide variety within the approved budgets. Can one solve this problem by continuing with old habits? As organizations surge towards a digital economy, need of the hour is to leverage technology and reduce the repetitive manual workflows. It is time to shake up existing systems, embrace new ways to solve the problems. By using wings of technology & a human touch, one can only get a sea of options to explore and fulfill the ever-growing challenges of enterprise food & team outing needs. It boosts morale and is an easy & cost-effective way to add value to organization and employees. 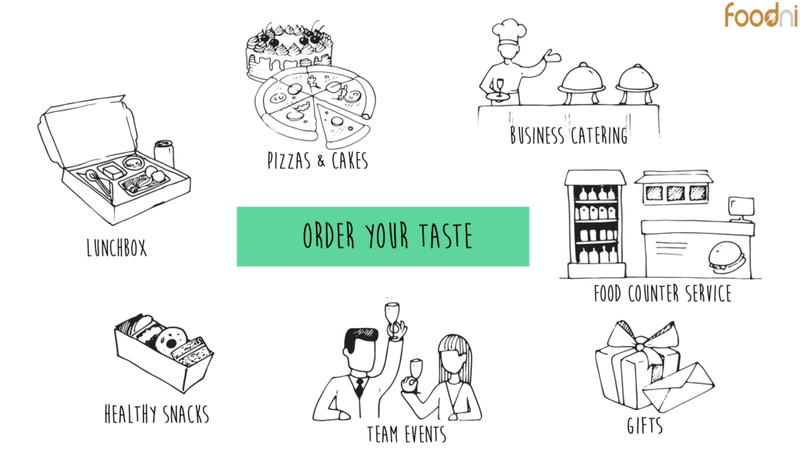 Supporting teams can order and have personalized food options delivered with great variety, good taste and convenience at the best prices. However, if you continue the old way to order the same tired options every time food is catered in, employees become less enthused. It’s not very rewarding to get same style of services from same vendor every single day now is it? What about your health conscious, gluten-free employees or foreign delegates? Imagine the possibility of bringing in specialty chefs to interact with employees at the food court in order to provide unique products and an option personalize the experience too which normally wouldn’t be possible at a typical corporate cafeteria. Thankfully, one thing that has evolved in recent years is the food service industry. It has truly disrupted the once serene surface and made waves. And companies everywhere love riding these waves. This new food technology isn’t just about making more food, or even creating new foods. It also utilizes customer data to customize it to the needs of their consumers. Hotels, Restaurants & Catering companies are sinking their teeth into this bit in particular because it now allows them the power to market themselves, provide variety, healthy locally-sourced and fresh foods that taste great. Food tech companies have disrupted the way corporate caters food for employees in-house as well as for team events and outings because it is largely based on efficiency, something the super-busy can appreciate. Healthier, fresher choices that are more readily available and appealing offer added value to team members. Instead of being forced to eat more unwanted meal or high-calorie snacks, corporations are finding more and more that the old adage of getting to someone’s heart through their stomach is incredibly true. With more healthful choices, supporting teams can also feel good that they are caring for the health of employees through proper food & lifestyle choices. And the employees themselves can feel good, eating food that tastes great while being healthy and nutritious, which leads to better productivity and increased job satisfaction overall. Partners like www.foodni.com who provide a single window service bridging the gap between the company and the food partners provide a great value to both ends. An exclusive B2B online marketplace connecting corporates & merchants to comprehensively discover, get quotes, order, track, pay, reconcile and manage employee morale budget spends without losing a human touch. It’s time to raise awareness of the opportunities for improvements in the corporate food ordering systems and uncover insights that will shape how we make our eco-system more transparent & sustainable. Supporting teams and the service providers have to do so squarely by challenging and testing existing systems, beliefs and technologies. Why now? Human race is more engaged with and interested in the food & lifestyle topics than ever before. We must bring that awareness and understanding, and harness the passion of our communities to inspire, discover, share, and embrace the ideas that will improve the health of our ecosystem. Think about it. It costs far less to feed your talented team than it does to replace one member every time someone leaves. While employees should absolutely be rewarded with higher pay after much time spent working for your company, a very cost-effective way to make your employees and delegates love you back is to feed them right. The food industry and the customer ordering habits are evolving and it’s evolving quickly. By and large, companies and service providers are now looking forward to this food disruption. So experiment the new ways to increase the value chain, grow your teams and keep them around for years to come by simply bringing more to the table! Previous PostPrevious Is food wastage a trending thing now ?